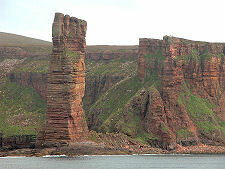 Orkney is a group of 67 islands lying off the north coast of Caithness. Only about a third of the islands are inhabited. 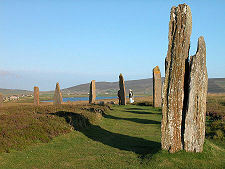 For accommodation in Orkney see the links in the "See and Stay" menu above. See the map below for an outline of Orkney and links to connecting areas. 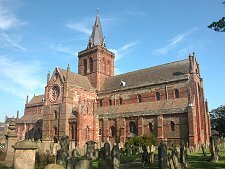 After centuries of Norwegian rule, Orkney was annexed as part of Scotland by James III in 1468 after its rents had been pledged as security against a dowry that was not paid. The Norwegians have never formally recognised Orkney as part of Scotland. But while signs of a Norse history can be seen everywhere, Orkney's history goes back much further. 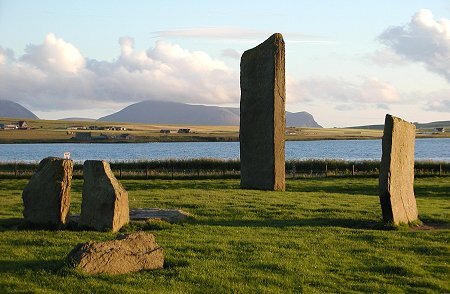 It has been said that if you scratch Orkney, it bleeds archaeology. As a result, parts of West Mainland have been declared a World Heritage Site. This includes the superbly preserved prehistoric village at Skara Brae, the standing Stones of Stenness, the Ring of Brodgar, and the chambered tomb at Maeshowe. Other ancient sites include Cuween Hill Cairn and Unstan Cairn on West Mainland. A more recent discovery in East Mainland is the mound at Mine Howe, complete with stone steps leading down into its heart, though after a period open to the public this appears to have been abandoned. There are also excellent Brochs at Gurness on the West Mainland, at Burroughston on Shapinsay, and, perhaps best of the lot, Midhowe Broch on Rousay. Rousay is also home to enough neolithic tombs to have become known as the Egypt of the north. 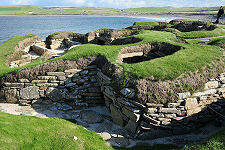 Slightly later history remains on view in the form of the Norse settlements on the tidal Brough of Birsay and the rock stack at the Brough of Deerness, the circular church at Orphir, the Earl's Palace at Birsay, the Earl's and Bishops' Palaces in Kirkwall, Skaill House near Skara Brae, the Martello towers on Hoy, Noltland Castle on Westray and, most magnificent of all, St Magnus Cathedral in Kirkwall. 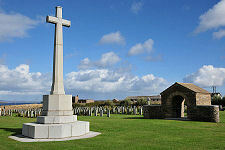 And Orkney still carries the signs of a turbulent 20th Century history, when Scapa Flow served as a major naval base. These include the still functional Churchill Barriers, forming causeways between the eastern isles. Overlooking one of them is the Italian Chapel, constructed by Italian prisoners of war. 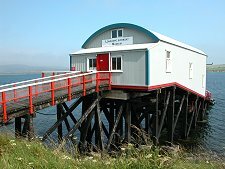 On Hoy, the Scapa Flow Visitor Centre is housed in an old naval oil pumping complex at Lyness, while less well known concrete lookouts and gun towers still dot many headlands overlooking the approaches to Scapa Flow, especially at Ness Battery near Stromness. 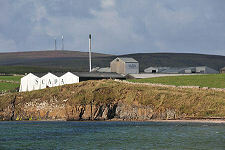 Near Kirkwall is Scapa Bay, home to the modern Scapa Flow Control Centre and a nice beach and pier in a lovely setting. This is also home to the poignant Royal Oak Memorial Garden. But Orkney is really about its islands. Largest by far is Mainland. At its centre, literally, is Kirkwall, the capital of Orkney and an important port. 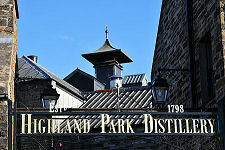 It is also home to Highland Park Distillery, an essential stopping off point for passengers on the many cruise ships that visit Kirkwall each year. Also close by is Scapa Distillery, which has been open to visitors since 2015; while in the centre of the town is Orkney Distillery, a gin distillery. At the south west end of West Mainland is Stromness, another important port with a huge amount of character and the main ferry terminal on Orkney. Stromness Museum in the heart of the town is fascinating, as is the nearby Ness Battery. Other visitor attractions in West Mainland include the village of Finstown; Orkney Brewery; HMS Tern, where you find the ruins of a WWII naval airfield; Kirbuster Museum; Corrigall Farm Museum; the Hall of Clestrain; and Dounby Click Mill. South from Kirkwall you can visit four more islands via the Churchill Barriers, the largest being South Ronaldsay with its attractive main village of St Margaret's Hope. This is the port used by Pentland Ferries' car ferry from Gills Bay near John o' Groats. You can also reach Orkney by passenger ferry from John o' Groats, by the long standing car ferry route between Stromness and Scrabster near Thurso, operated by NorthLink Ferries: and also by NorthLink Ferries' links from Kirkwall to Aberdeen and Lerwick. The main southern island is Hoy, the most hilly and least developed island in the group with its largest settlement at Longhope. 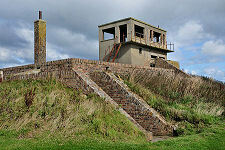 Much of the fascination of the island revolves around the WWII remains at Lyness. Also on Hoy or connected South Walls are Melsetter house and the Longhope Lifeboat Museum. Not far from Hoy is the most industrialised of Orkney's islands, Flotta, used as an oil terminal. To the north of Mainland lie two inner islands, Rousay and Shapinsay, accessible by regular ferries from, respectively, Tingwall and Kirkwall. Ferries from Kirkwall also go to the four main islands lying further north, Westray, Eday, Sanday, and Stronsay. Westray is largely a farming island. Its main village at Pierowall, which is also the terminus for the ferry to nearby Papa Westray, is 7 miles north of the Kirkwall ferry terminus at Rapness. 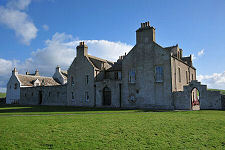 Attractions on Westray include Noltland Castle, Lady Kirk and Cross Kirk. Sanday is the largest of the north isles, with the ferry terminal at its south west tip and its main village at Kettletoft. Nearby are the fascinating Quoyness Cairn, and the ruins of Lady Kirk. Stronsay lies to the south of Sanday and the ferry takes you directly to the main village at Whitehall. Attractions include Moncur Church and the Vat of Kirbister.